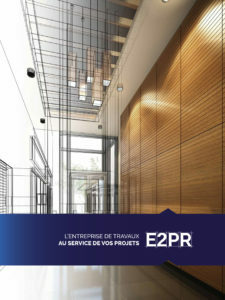 The purpose of these provisions is to inform users of the www.e2pr.fr website of our policy regarding the collection, use and sharing of any personal data that they may provide us with when using the site. The entity responsible for processing the data is E2PR, a French limited liability company with registered capital of €10,000, entered in the Paris company register under number 751 351 438, whose registered office is at 4, rue Aminata Traoré, 94460 Valenton. E2PR may be required to collect information about its users when said users wish to contact the company through the means proposed on the contact page of its website, in particular by phone, regular mail, via the following email address contact@e2pr.fr or the contact form. Data that may be collected in such instances includes surname, first name, address, email address, telephone number, IP address, connection and browsing data, and any other information that the user may wish to communicate. carry out analysis and collect statistics on site use and reach. All of the data collected will be lawfully processed, in a fair and balanced way, in keeping with the aforementioned purposes and having obtained any approval necessary, pursuant to the legitimate interests of the company or with regard to legal and regulatory obligations. E2PR will take all necessary precautions to ensure the security and confidentiality of the data collected. The use of social media sites and E2PR webpages in connection with such social media sites is likely to result in certain data being collected and exchanged between the social media sites and E2PR. Users are invited to consult said social media sites’ personal data protection policies in order to specifically learn about the information that is being collected by such sites and that can be transmitted to E2PR, as well as the purposes for which such information is used, in particular for any advertising purposes. Users can change the settings regarding access to and confidentiality of this data directly on the social media sites. E2PR may collect, on its own behalf, certain information and personal data relating to users’ activity on E2PR social media pages. The information gathered by E2PR on its own behalf through social media sites is governed by these terms and conditions. Users are also invited to consult the webpage dedicated to Cookies to find out more about cookies and social media plugins and how to refuse or block them if necessary. However, E2PR is not responsible for the use that is made of user data collected by social media sites on their own behalf. E2PR may share the data collected from users with service providers or subcontractors in strict compliance with these provisions and within the scope of the aforementioned purposes. E2PR will ensure that its service providers and subcontractors implement the appropriate security precautions as regards the personal data that they process and that they comply with the legislation in force in this regard. Data will never be transferred outside the European Union. Users’ personal data will be stored for three years from the date of the activity having caused such collection. a longer storage time is imposed pursuant to a legal or regulatory provision. a right to portability: to recuperate data provided or transmit it to a third party if technically possible. Any request must be precise and justified. Notably, the user must precisely specify his/her surname, first name, address and email address, and attach copy of his/her ID to the request in order that he/she may be identified with certainty. Pursuant to the regulations in force, for any question regarding data protection the user may make a request the company’s data protection officer (DPO) via the aforementioned channels, or contact the CNIL (French Data Protection Authority – www.cnil.fr) for any information and/or to lodge a complaint. E2PR reserves the right to amend and update the present notice without informing the user, subject to all legal or regulatory requirements and/or any new use of users’ data requiring consent for example or any other specific procedures. Users are therefore invited to regularly inform themselves of the provisions relating to personal data.